Chinese stir fried aubergine (or eggplant) does not sound particularly alluring. But cooked with the Chinese Yangshuo style sauce it makes an incredibly tasty vegetarian dish or appetiser. 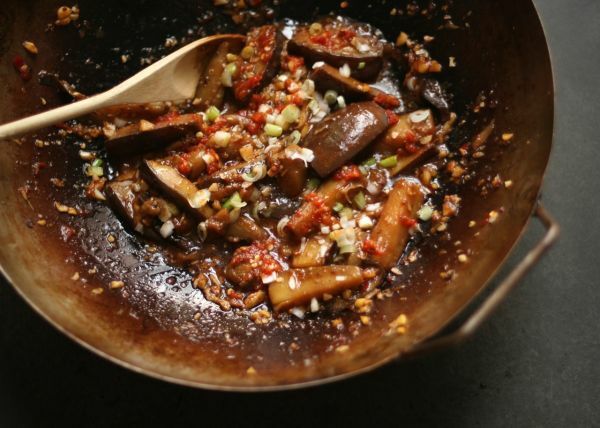 Slide the aubergines down the side of the wok to avoid the oil spattering and stir fry on a medium heat until browned and soft. Reduce the heat and add ginger and garlic, mixing it in (on a medium heat). Add the soy black bean chilli paste and cook until fragrant (on a medium heat). Add spring onions, mixing together until the water has evaporated.